On a balmy evening that felt more like May than December, nearly 800 of Tidewater Community College’s more than 2,000 graduates walked across the Ted Constant Convocation Center stage on Dec. 20 to receive their degrees and certificates. 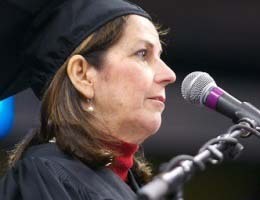 Edna V. Baehre-Kolovani, president of TCC, opened the 57th Commencement Exercises by welcoming dignitaries and also acknowledging the thousands of family and friends waiting to see “their” graduate. 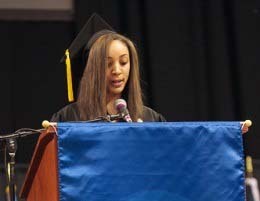 Catara Dillard spoke on behalf of the students, and TCC alumna Carol Curtis delivered the keynote address. Dillard, graduating with an Associate of Science in Social Sciences with plans to attend Sentara College of Health Sciences to become a surgical technician, credited TCC with helping develop her confidence and independence. Curtis, who graduated from TCC with an Associate of Applied Science in Civil Engineering Technology, started her own company, Noah Enterprises, in 2004. Today the $20 million operation, among the fastest growing companies in the region, is an industry leader, as is its founder. John Padgett, vice chair of the TCC College Board, reflected on the passing in June of Board Chair Tom Wilson prior to introducing Curtis. “Tom would be immensely proud of the students gathered here tonight,” Padgett said. 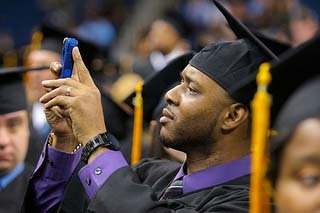 Graduates were awarded TCC Alumni pins as they came off the stage. Following the conferring of degrees and certificates, Alumni Association Board Chair Gerald Ortiz welcomed the newest alumni. Following the singing of the alma mater and a cake-and-punch reception, the graduates and their families walked out into the warm December night, ready for the next chapter of that story.